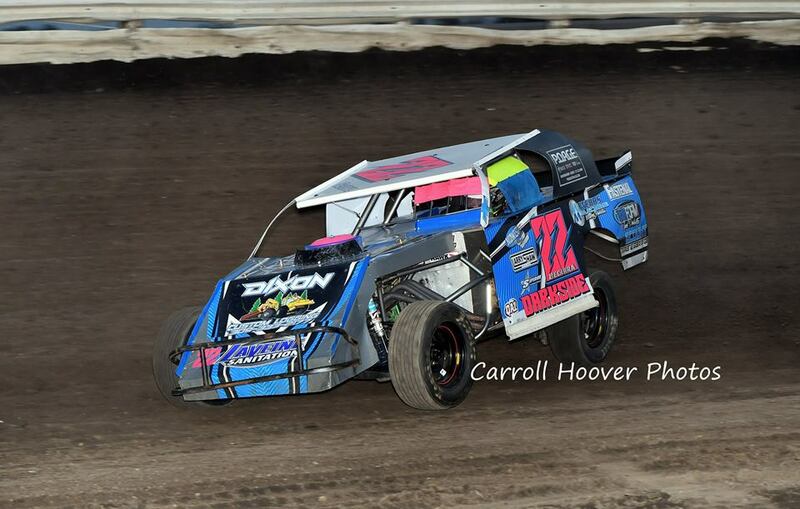 Donnellson, IA (Saturday, March 23, 2019) – The second and final night of the 7th Annual Spring Extravaganza was held on Saturday, March 23rd at the Pepsi Lee County Speedway in Donnellson, Iowa. And with a slight chance of rains moving in sometime in the night, the action would be rushed through as fast as possible to beat any weather. And when the final checkered flag waved it was Michael Long (Budweiser Modifieds) and Jacob Houston (Discount Tire & Service Sport Compacts) who repeated their wins from Friday night. 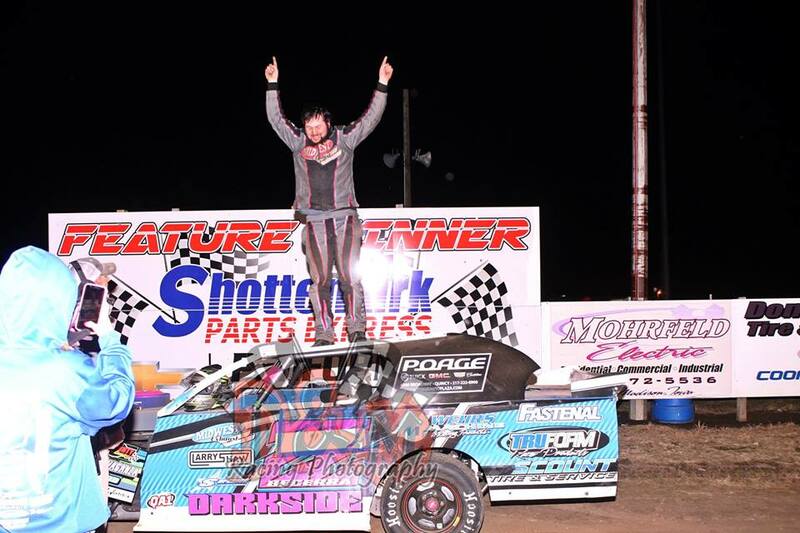 While Dustin Bluhm (I-Smile Silver Late Models), Damon Murty (Donnellson Tire & Service Stock Cars), and Austen Becerra (Roberts Tire Center SportMods) picked up their first wins of the season at the track. 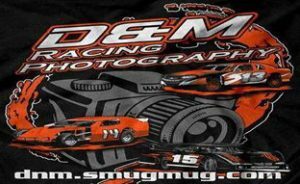 Once again the I-Smile Silver Late Models kicked off the nights action, with Dustin Bluhm and Brandon Queen drawing the front row. Bluhm used his starting spot to his advantage by jumping out front on lap 1 over Jay Johnson and Tommy Elston, who started 5th. With Bluhm out front, Elston was working on Johnson to try and get the second place from him. The action was slowed for the first and only time on lap 6, as Chris Morefield spun into the turn 4 guardrail to bring out the yellow. 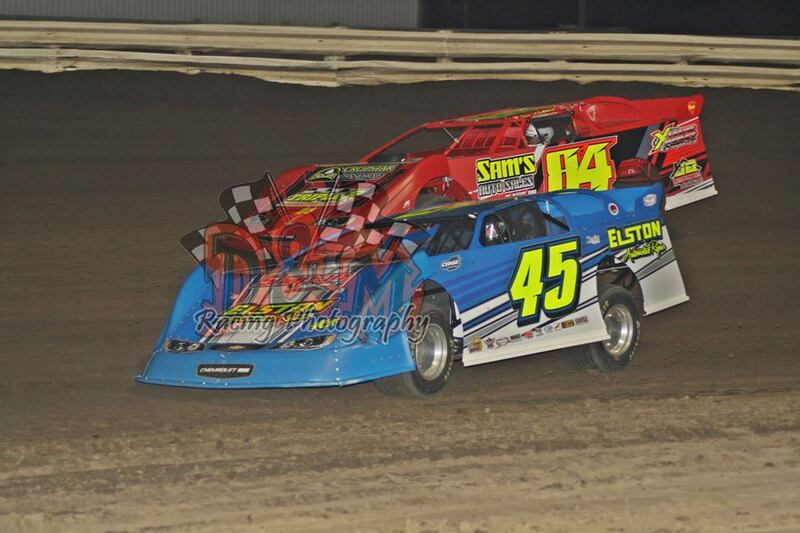 On the restart Bluhm moved back out front, with Elston once again trying to get second from Johnson. 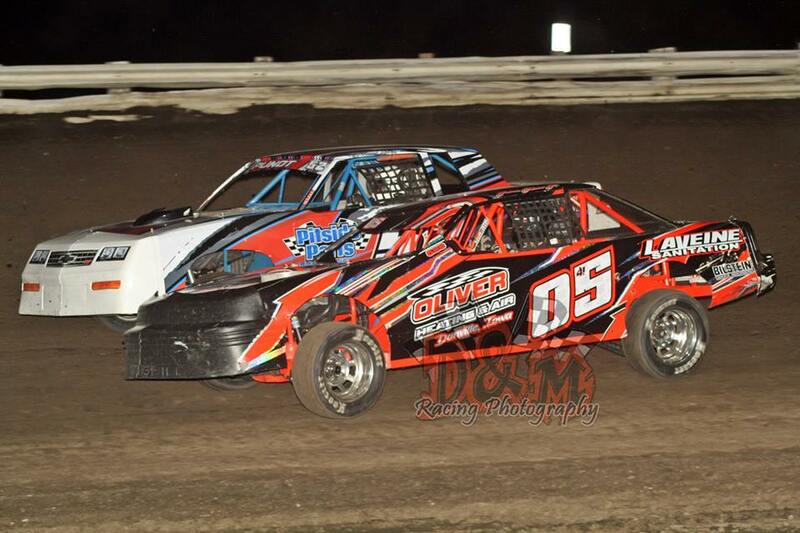 On lap 8 Elston finally made the move around Johnson and then set his sights on Bluhm for the top spot. While Bluhm worked the bottom of the track, Elston would work the middle to upper groove to try and get by. The momentum almost paid off coming off turn 4 coming to the white flag, as Elston raced Bluhm side-by-side into turn 1. Bluhm was able to hold off Elston down the backstretch. 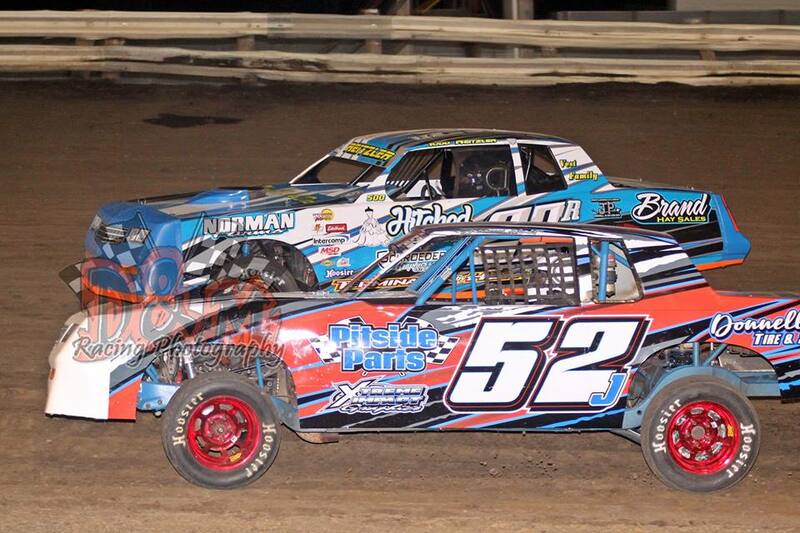 Elston again tried to use the momentum off the top of turn 4 coming to the checkered to get past Bluhm. But Blum was able to hold him off by a car length to claim his first ever win at the Pepsi Lee County Speedway, which was worth $900 thanks to Jimmie Sykes and David Weeks. 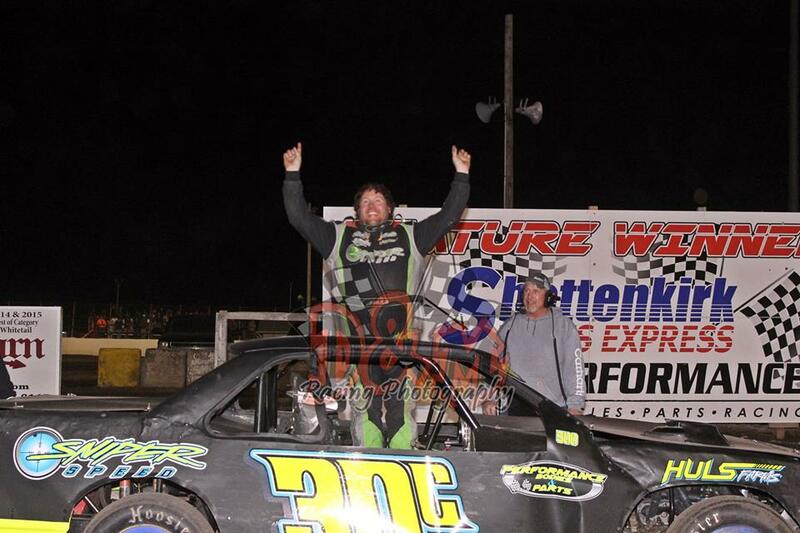 Elston settled for 2nd, Johnson was 3rd, Denny Woodworth was 4th, with Sam Halstead coming home in 5th. Up next was the 22 lap Donnellson Tire & Service Stock Cars, with Todd Reitzler and Damon Murty leading the field to green. Reitzler would edge Murty out at the line to lead lap 1, only to have Murty slip back by to lead lap 2. 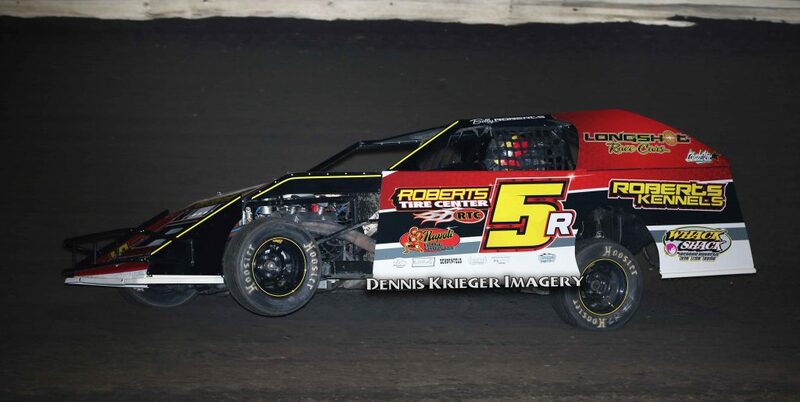 While Murty set the pace out front, the battle was for second between Reitzler, Jeemy Pundt, Derek Green, who started 5th, Cayden Carter, who started 6th, and Abe Huls, who started 7th. Just as Murty started to pull away the first caution of the race would slow him down on lap 5. Chad Krogmeier and Michael Bilyeu collided in turn 2 to bring out the yellow. On the restart Murty jumped back out front, with Reitzler and Pundt battling for second. Huls would emerge from the pack in the runner up spot on lap 11, and he then quickly closed in on Murty for the lead. Huls would look under Murty over laps 14 thru 17, when the second caution of the race slowed the action. This time Peter Stodgel spun in turn 1 to bring out the yellow. Murty once again grabbed the lead on the restart, with Huls and Carter glued to his back bumper. Going into turn 1 on the white flag lap Carter tried to get under Murty, but he would get sideways and collected Jeremy Pundt to bring out the yellow. On the green-white-checkered overtime restart Adam Klocke, who started 15th and was running 4th, and Huls made contact and spun in front of the field to collect four other cars to bring the yellow light back on. 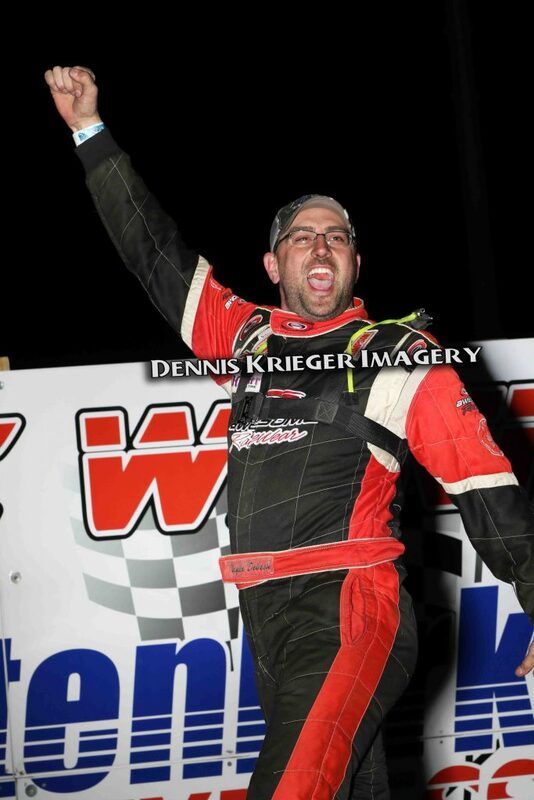 The follow attempt of an overtime restart saw Murty jump back out front, and then he held off a last lap challenge from Green to pick up a $1,250 payday. 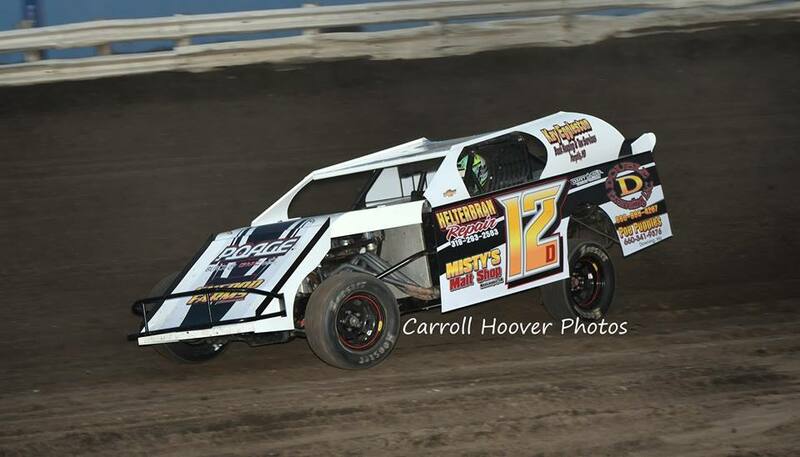 Green settled for 2nd, John Oliver Jr. came from 12th to finish in 3rd, Jay Schmidt started 8th and finished 4th, with Kyle Brown finishing 5th after starting in 9th. Brandon Dale and Brandon Jewell drew the front row for the 20 lap Roberts Tire Center SportMod feature, with Jewell leading lap 1 by a nose over Dale. Dale would come back to slip past Jewell on lap 2 to take the top spot. With Dale setting the early pace, all eyes were on Austen Becerra, who started 10th, as he was slicing his way through the field. On lap 4 Becerra worked himself into the runner up spot, only to be slowed on the completion of that lap for debris in turn 3. On the restart Becerra shot past Dale to take the top spot, only to be slowed one lap later. 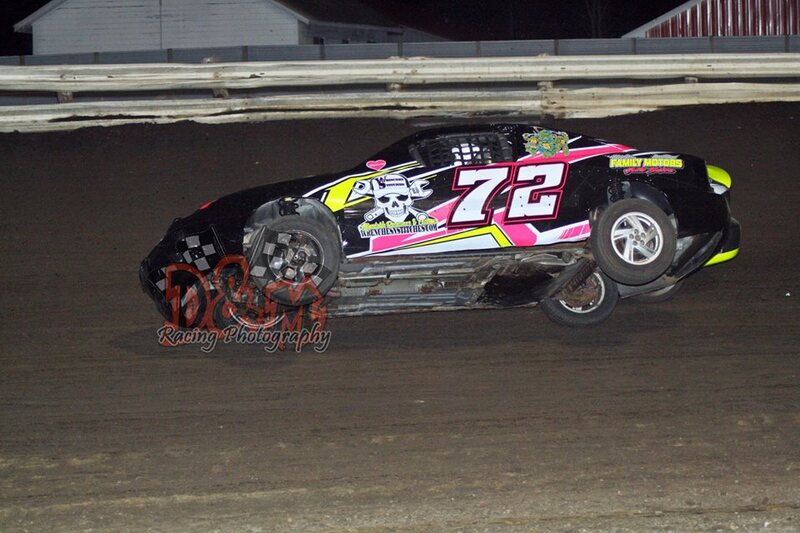 As Colton Livezey, who was running 2nd, got into turn 3 to hot and looped it to bring out the caution. On the restart Brandon Lambert spun in turn 2 and collected Brandon Tharp, Bob Cowman and Colton Bowman to bring the yellow light back on. The next restart brought out another caution, as debris in turn 1 slowed the action. 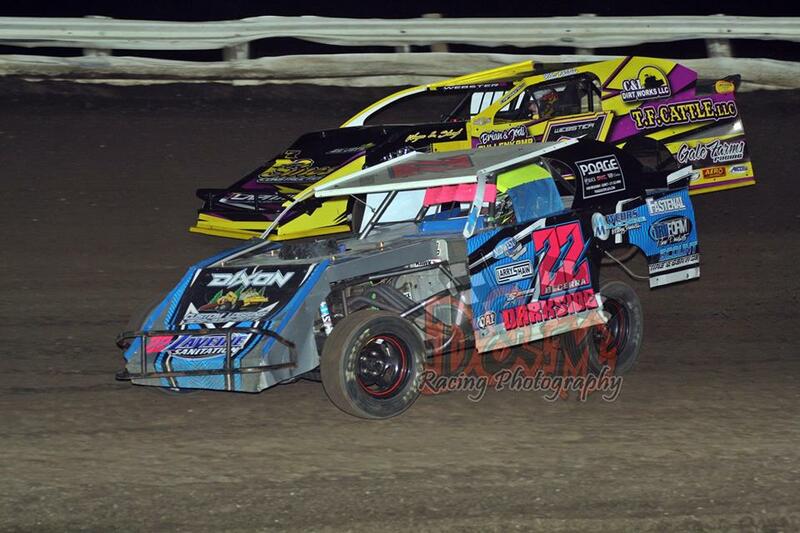 Becerra jumped back out front on the third restart, with Dale and Tyler Soppe, who started 7th, following behind. Just as Becerra started to pull away the final caution of the race appeared on lap 9, this time Cowman spun in turn 1 to bring out the yellow. Once again Becerra jumped out front on the restart, with Soppe, Nathan Bringer, who started 8th, and Brayton Carter, who started 11th, battling it out for second. Without another caution to bunch the field back up, Becerra would cruise to an easy win and claim the $1,250 check to go with it. 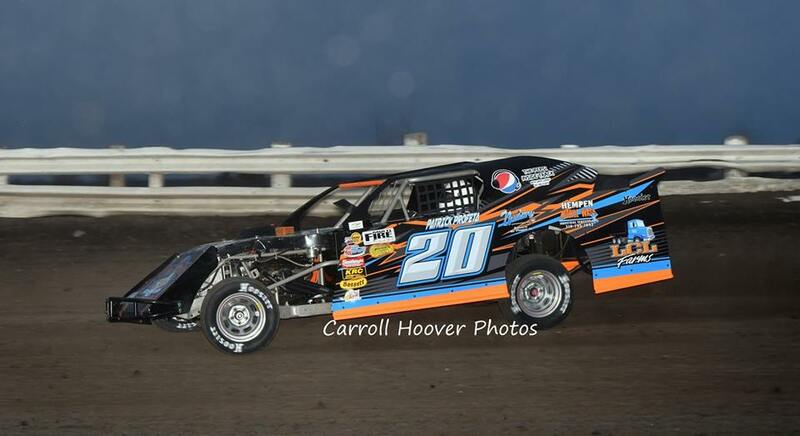 Soppe won the battle for 2nd, Carter was 3rd, Earl Pryor would finish 4th, with Bringer rounding out the top 5. Up next was the 22 lap Budweiser Modified feature, with Mike Van Genderen and Austin Howes leading the field. Howes used the momentum off the top of the track to edge Van Genderen at the line to lead lap 1. But Van Genderen would slip past him on lap 2 to take over the top spot. Michael Long, who started 4th, would over take Howes for the runner up spot on lap 4 and then went to work on Van Genderen for the lead. Long tried to look under Van Genderen over the next 5 laps. But going into turn 3 to complete lap 10 Long would change his entrance, as he went in high and shot to the bottom coming off turn 4. And when Van Genderen left the bottom opening going into turn 1 Long would take advantage by slipping under him to lead lap 11. Van Generen would keep pace with Long for a couple of laps, before Long pulled away for the sweep of the weekend. Which was worth $1.600 thanks to the extra money from David Weeks. Van Genderen settled for 2nd, Howes was 3rd, Jeremy Mills finished 4th after starting in 7th, with Derrick Stewart coming home in 5th. 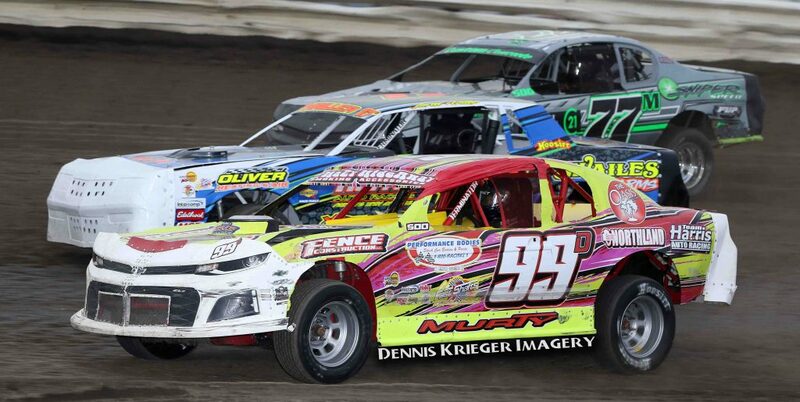 The final feature of the night was the 14 lap Discount Tire & Service Sport Compacts. And when twenty-six of the twenty-seven cars signed in came to the track, many people thought this was going to be a caution plagued race. But that was far from the case. Barry Taft and Drake Bohlmeyer drew the front row for the event, with Taft grabbing the lead by inches over Jacob Houston to lead lap 1. Houston would slip past Taft on lap 2 to grab the top spot away. The top five cars would start to pull away from the rest of the field, when the action was slowed for the first and only time on lap 11. Cody Staley would spin in turn 4 to bring out the yellow. On the restart Houston jumped back out front, with Jason Ash, who started 12th, coming from 5th, to second. Ash would try to get past Houston on the final lap. But Houston would hold him off to score the sweep of the weekend, and collect $400 for his efforts. Ash settled for 2nd, Taft was 3rd, Jeffrey DeLonjay started 7th and finished 4th, with Chris Vannausdle finishing 5th after starting in 10th. 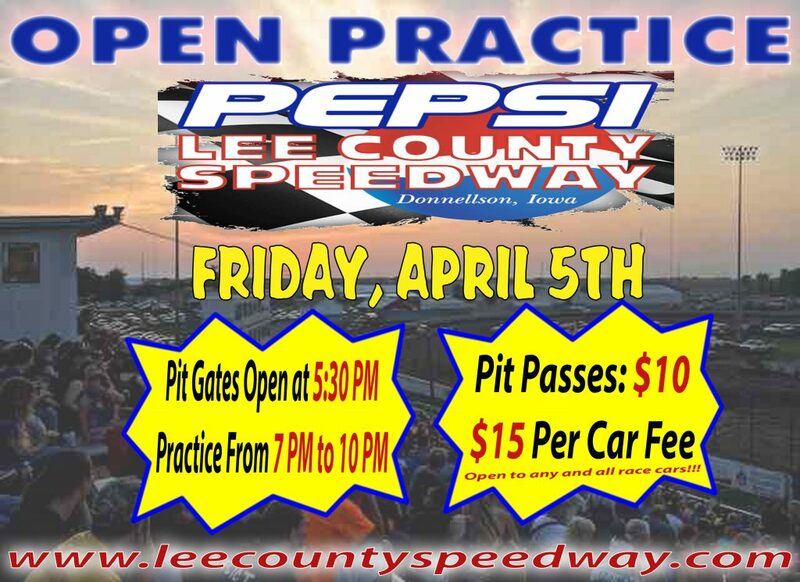 The Pepsi Lee County Speedway will hold an open practice on Friday, April 5th, before kicking off the regular points season on Friday, April 12th. 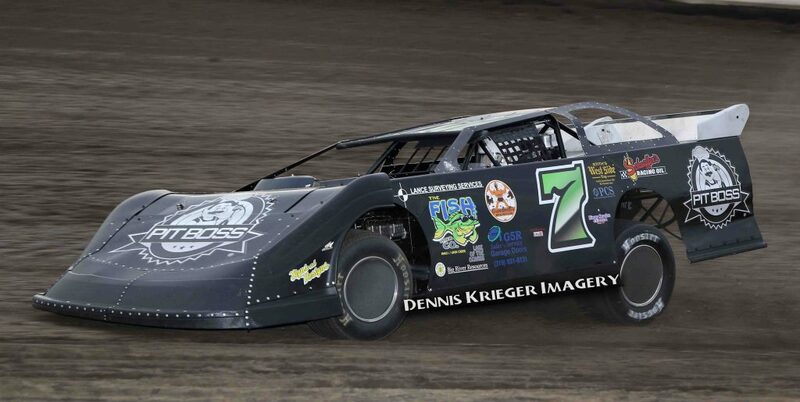 Keep a eye on the Facebook page and the website, www.leecountyspeedway.com, for more information about upcoming events. Heat 1: 1. Aaron Johnson; 2. Jeremy Mills; 3. Vance Wilson; 4. John Oliver Jr.; 5. Derrick Stewart; 6. Kelly Buckallew; 7. 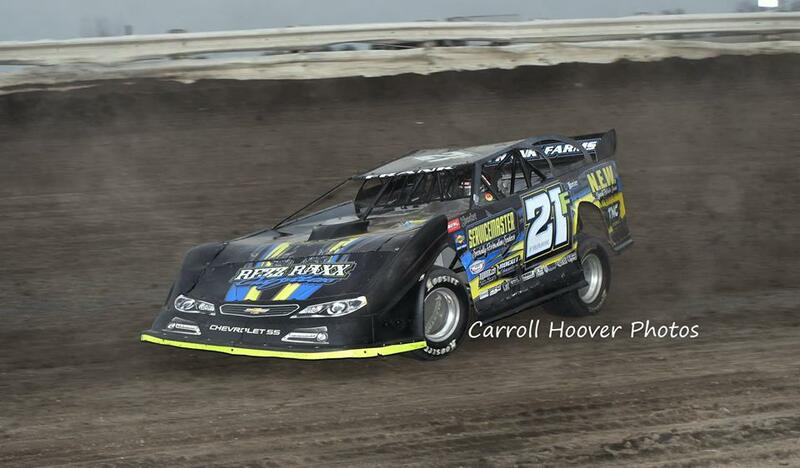 Bill Roberts Jr.
Donnellson, IA (Friday, March 22, 2019) – After a cold and snowy winter many thought there would be no chance of the 2019 racing season getting starting anytime soon in the Midwest. 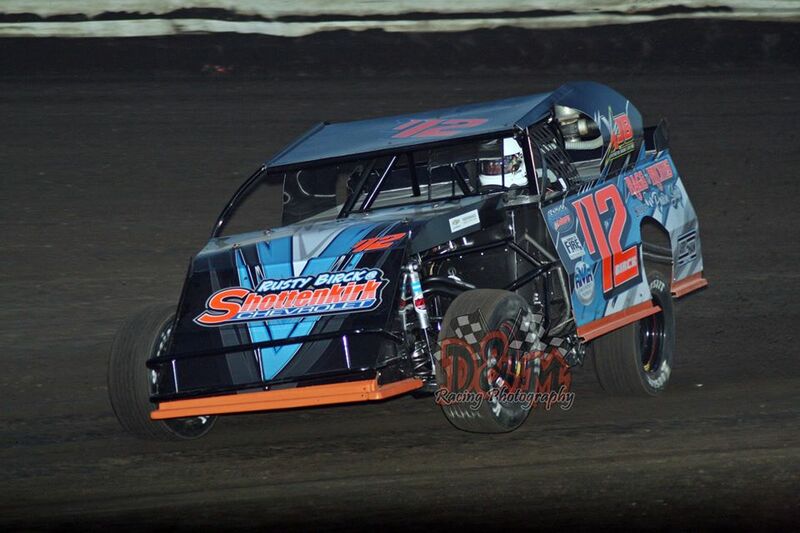 But with a lot of hard work and determination by the crew at the Pepsi Lee County Speedway in Donnellson, Iowa the opening night of the Fall Extravaganza was put into the books on Friday, March 22nd. 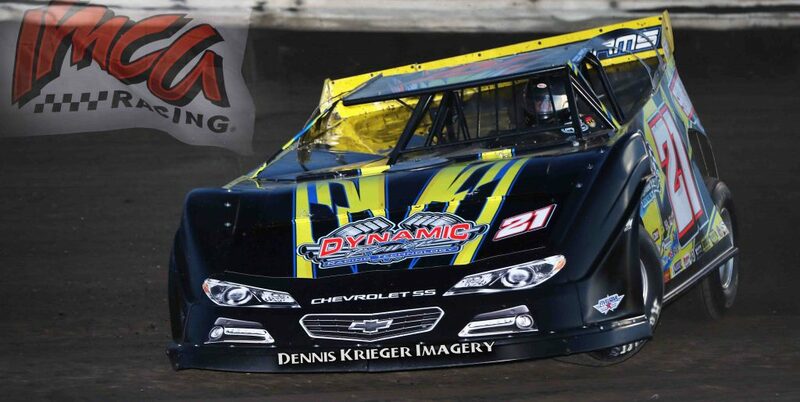 Coming away with opening night wins were Tommy Elston (I-Smile Silver Late Models), Michael Long (Budweiser Modifieds), Abe Huls (Donnellson Tire & Service Stock Cars), Tyler Soppe (Roberts Tire Center SportMods), and Jacob Houston (Discount Tire & Service Sport Compacts). The first feature to take to the track was the 20 lap I-Smile Silver Late Models, with Dustin Bluhm and Sam Halstead drawing the front row. 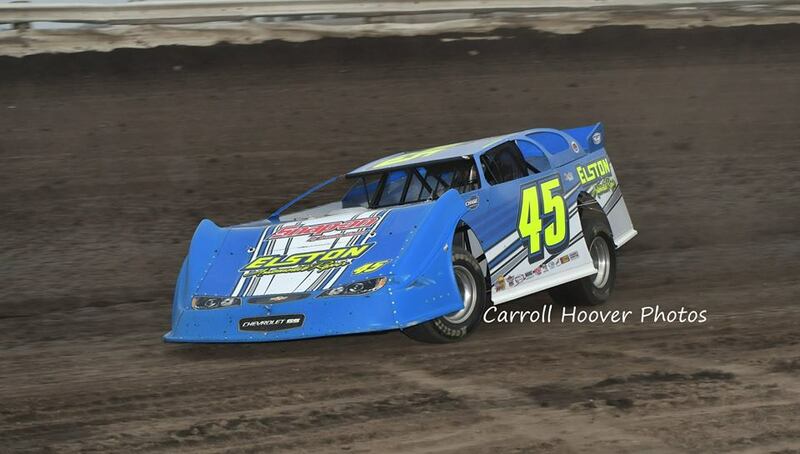 Bluhm would take advantage of his starting spot to grab the lead on lap 1 over Halstead and Jay Johnson. The action was slowed for the first time on lap 4, when debris in turn 3 brought out the caution. On the restart Bluhm jumped back out front, with Johnson over taking Halstead for second. Just after the lap was scored complete Bryan Berger spun into the guardrail in turn 4 to bring out the yellow. Bluhm again grabbed the lead on the restart, with Johnson and Tommy Elston, who started 5th, close behind. 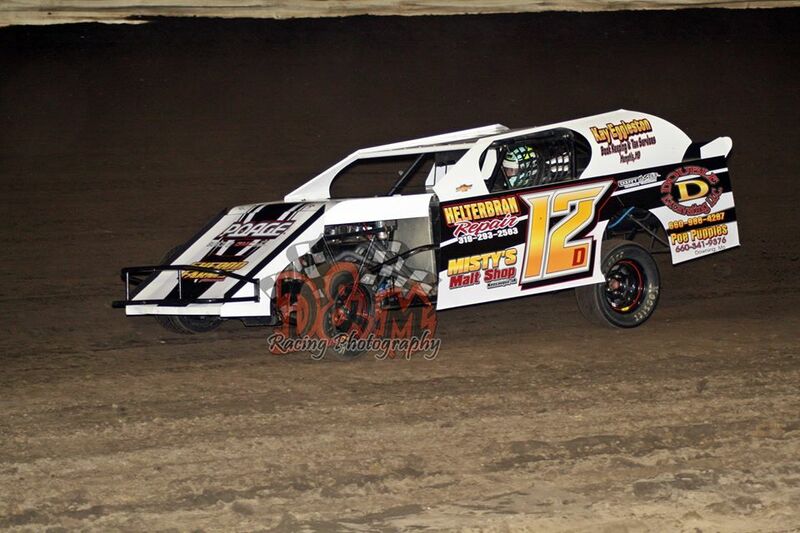 Two more laps would be scored complete when Todd Frank spun in turn 2 to bring the yellow out. On the restart Bluhm jumped back out front with Johnson and Elston still following. Disaster would strike Bluhm on lap 9, when he spun in turn 1 to bring out the yellow. 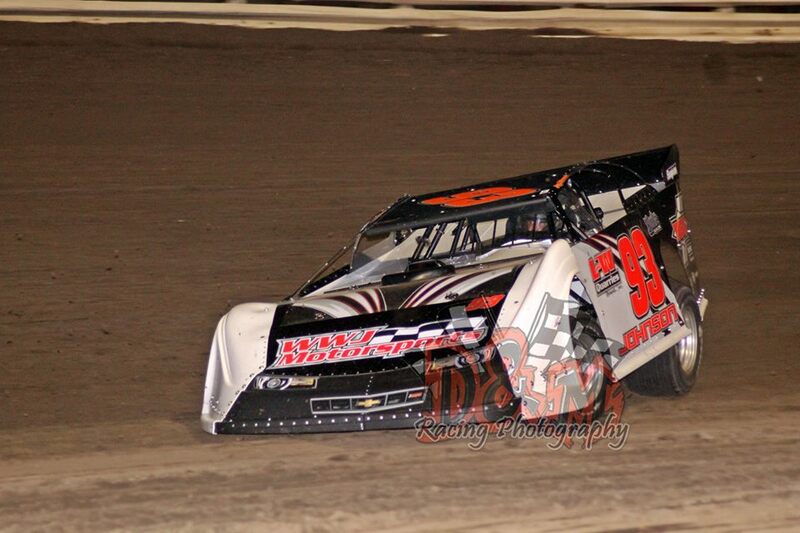 This would hand the lead over to Johnson on the restart. On that restart Brandon Queen spun in turn 1 to bring the yellow light back on. 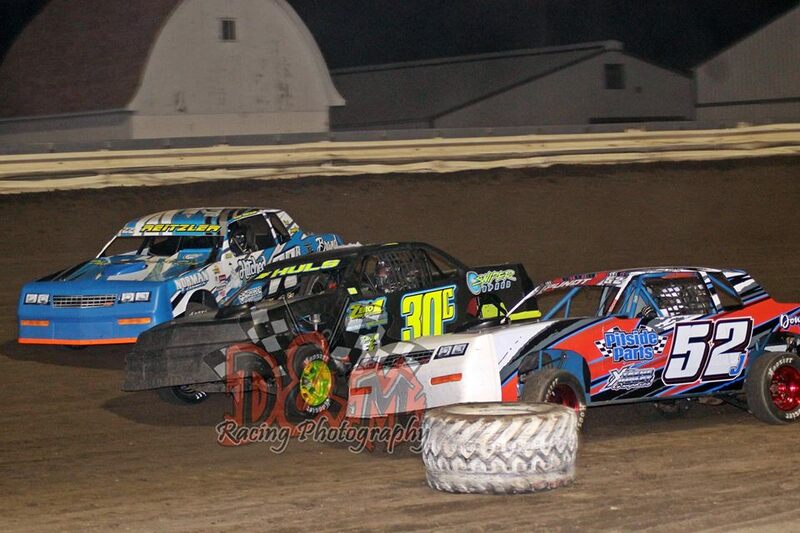 The following restart saw Johnson jump out front, with Halstead and Elston battling for second. Elston would secure the runner up spot on lap 11 and then went to work on Johnson for the top spot. Coming out of turn 4 to complete lap 17 Johnson slid high, which allowed Elston to pull even with him down the front stretch. Elston would come out turn 2 with the lead, and then pulled away over the final laps to pick up the win. Johnson was 2nd, Halstead was 3rd, Bluhm recovered from his spin on lap 9 to come back up to finish 4th, with Berger also recovering from an early spin to finish 5th. Up next was the 20 lap Roberts Tire Center SportMod feature, with Jeremy Gustaf and Brandon Dale leading the field to green. Dale would edge out Gustaf on lap 1 to grab the lead. While Dale set the pace out front, Gustaf, Nathan Bringer, Tyler Soppe, Daniel Fellows, who started 9th, and Austen Becerra, who started 7th, waged a battle for the runner up spot. 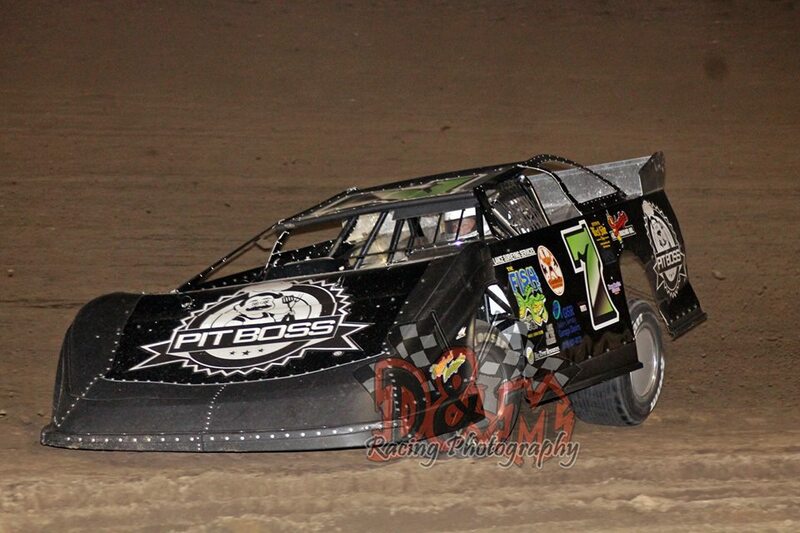 Soppe was able to grab the second spot on lap 11 and then went to work on cutting into Dale’s lead. On lap 15 Dale started entering lapped traffic, which allowed Soppe to close in on him quickly. Coming off turn 2 to come around to complete lap 16 Dale chose to try the topside to get around some lapped cars. This would allow Soppe to slip under him to grab the top spot away. 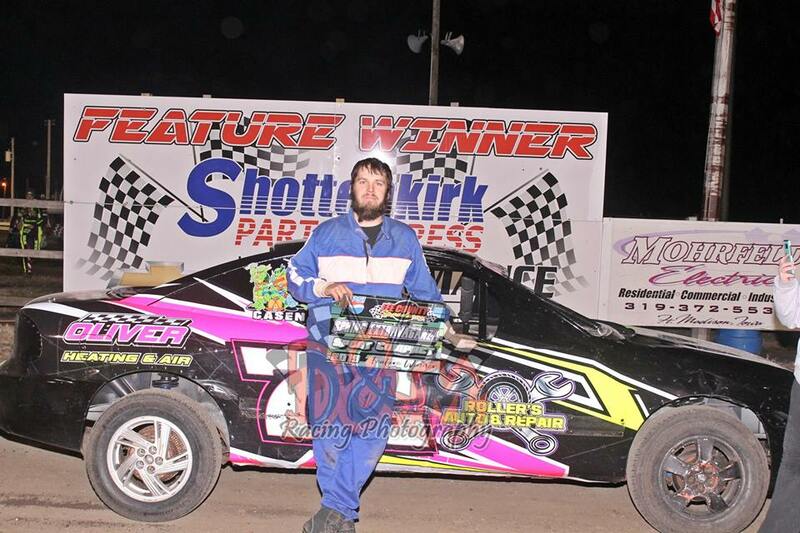 Soppe then pulled away over the final laps to score his first win at the Pepsi Lee County Speedway, and score the $1,000 check. Becerra made a last lap pass to finish 2nd, Dale was 3rd, Fellows was 4th, with Bringer rounding out the top 5. Abe Huls and Jay Schmidt drew the front row for the 22 lap Donnellson Tire & Service Stock Car feature, with Schmidt edging out the lead at the stripe on lap 1 over Huls. With Schmidt out front, Huls, John Oliver Jr., Derek Green, Damon Murty, who started 5th, and Todd Reitzler, who started 8th, made it a six car battle up front. 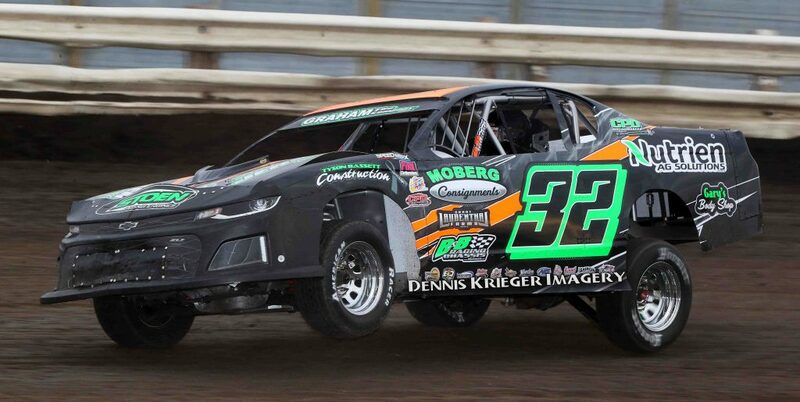 Huls would find a groove up top to his liking, which allowed him to challenge Schmidt for the top spot on lap 9. 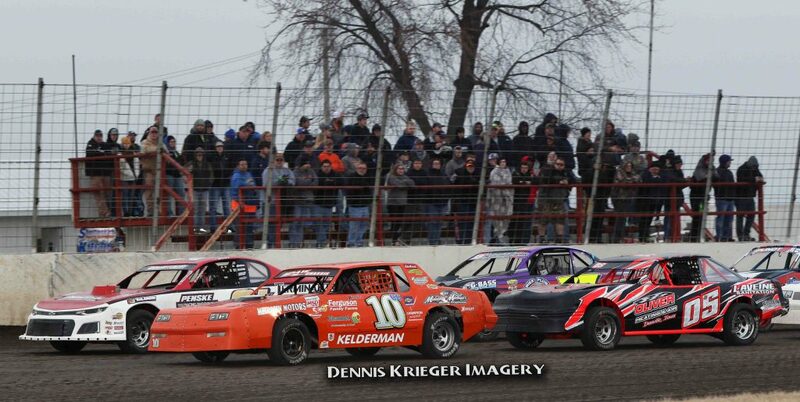 When Schmidt upset the car in turn 3 coming to lap 10, this allowed Huls to shoot under him for the lead. Huls then started to pull away, when the first caution of race appeared on lap 16. Green, who was running fifth, slowed with a right rear flat and couldn’t get off the track. On the restart Huls moved back out front, but now had Murty glued to his back bumper. Murty would keep the pressure on Huls over the final laps, but Huls was able to hold on for the $1,000 paycheck. 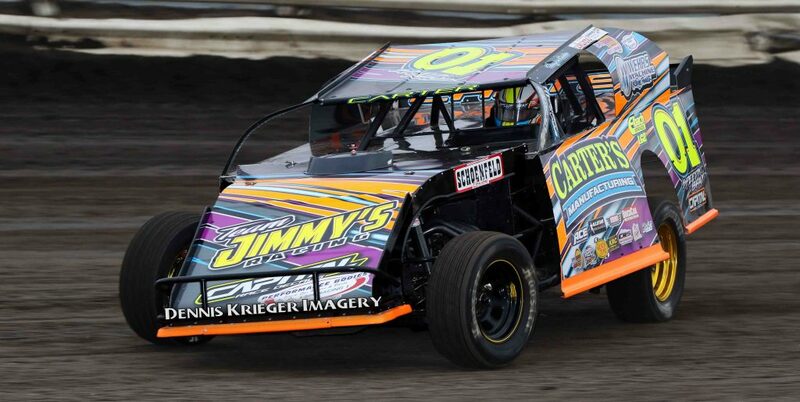 Murty was 2nd, Schmidt held on for 3rd, Oliver Jr. was 4th, with Jeremy Pundt coming from 9th to round out the top 5. Following the Stock Car feature was the 22 lap Budweiser Modified feature, with Aaron Johnson and Mike Van Genderen leading the field to green. Van Genderen took advantage of his draw to grab the lead on lap 1 over Chad Holladay and Jeremy Mills, who started 6th. The lead for Van Genderen lasted until lap 2, as he slowed off turn 4 before pulling into the infield in turn 1. This would hand the lead over to Holladay. 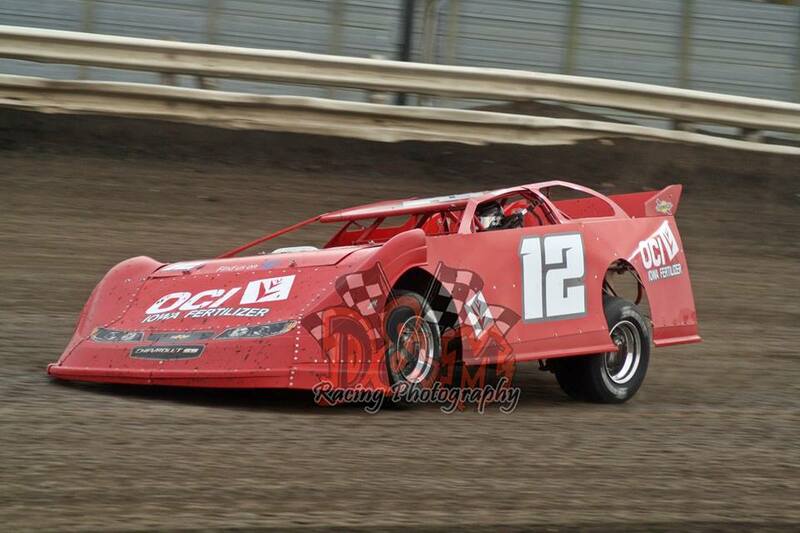 With Holladay setting a fast pace out front. Micheal Long, who started 10th, was working his way towards the front. Long would challenge Mills for the runner up spot on lap 6, before over taking him on lap 7. He then went to work on cutting into Holladay’s lead. By lap 17 Long had pulled himself up to Holladay’s back bumper. Then on lap 19 he made a move off of turn 2 to take the top spot. Long then pulled away to claim the $1,000 top prize. 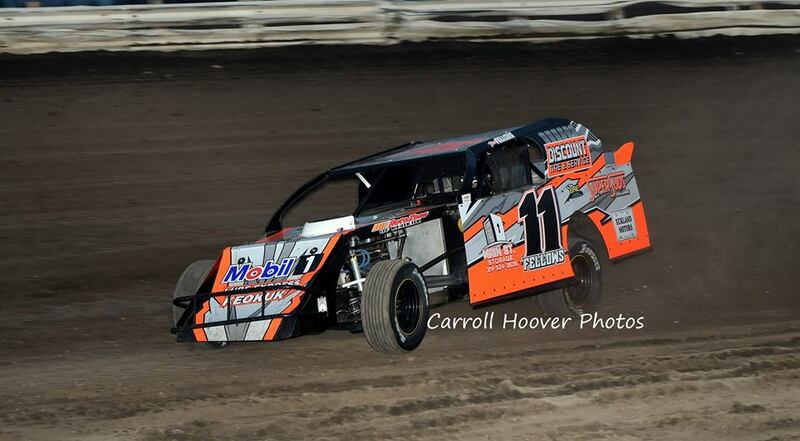 Holladay was 2nd, Mills was 3rd, Dave Wietholder started 8th and finished 4th, with Johnson holding on for 5th. The final feature to take to the track was the 14 lap Discount Tire & Service Sport Compacts, with Chris Wilson and Brandon Reu drawing the front row for the event. Reu would use his starting spot to his advantage, as he grabbed the lead on lap 1 over Barry Taft, and Jacob Houston, who started 8th. With Reu out front, Taft and Houston raced side-by-side for the runner up spot. Going into turn four to complete lap 4 Houston got up on two wheels, and with Taft to his outside it would help to settle him back down on all four tires. But as a result of the contact Taft would slow off turn 4 the following lap with a left front flat to bring out the one and only caution of the race. On the restart Reu moved back out front, with Jason Ash, who started 11th, over taking Houston for second. Ash would grab the top spot away from Reu on lap 9. Two laps later Houston made the pass on Reu to take second, and then went to work on Ash for the lead. Going into turn 3 on the final lap Houston got under Ash and then edged him at the line by half a car length to claim the win and the $300 top prize. Ash was 2nd, Reu was 3rd, Chuck Fullenkamp came from 7th to finish in 4th, with Zach Bohlmeyer coming home in 5th. Heat 1: 1. Dave Wietholder; 2. Michael Long; 3. Vance Wilson; 4. Mike Van Genderen; 5. Aaron Johnson; 6. Jeff Waterman; 7. Bill Roberts Jr.